The statistics seem grim: People who have diabetes are two to four times more likely to die from heart disease than people who don’t have diabetes. It’s tough to read this, but take heart. In honor of February being Heart Health Month, know that there’s a lot that you can do to keep your ticker ticking. Being told to follow a “heart-healthy diet” may conjure up images of dry, tasteless meals and giving up your favorite foods. The good news is that there are plenty of healthy foods that taste good and help your heart at the same time. You might even be surprised at the foods that made the list. What? You mean steak is OK to eat? As long as you go for lean cuts, such as top sirloin, tenderloin or 95 percent lean ground beef, red meat can definitely be heart healthy, and may even help you lower your LDL (“bad”) cholesterol. You might also be surprised to learn that lean beef has more monounsaturated fat, a healthy type of fat, than saturated fat. The key is making beef part of an overall heart healthy diet, and keeping portions reasonable (aim for no more than about 4 ounces per day). Stretch lean been further by slicing it into thin strips and stir-frying it with veggies of your choice — snow peas, broccoli and red pepper are great choices. Serve as is or over a whole grain of your choice. Four ounces of tenderloin contains 160 calories and 2 grams of saturated fat. Coffee-lovers can rejoice: A 2015 study out of Harvard University found that people who drank 3–5 cups of coffee every day were less likely to die from heart disease and stroke compared to people who drank little or no coffee. Other studies have shown similar benefits. Coffee contains polyphenols (plant compounds) that are thought to help prevent heart disease. However, before you reach for that additional cup of joe, keep in mind that coffee can raise blood pressure in some people, and it can make you feel jittery and keep you awake. If you’re a coffee-lover, drink filtered coffee, rather than using a French press, to remove cafestol, a substance that can raise cholesterol levels. Also, skip the sweeteners and flavored syrups, which can add unwanted calories and carbs. Think popcorn, and you might think of the super-sized bucket of popcorn you get at the movies (weighing in at more than 1200 calories, by the way, and don’t get me started on how much saturated fat it contains). Or maybe you picture an envelope of popcorn that you pop into the microwave. But these may contain unhealthy trans fat, as well as artificial coloring and flavoring. Popcorn — the kind that you pop yourself on top of your stove — is actually a whole grain; it’s also high in fiber and antioxidants, which are important in the fight against heart disease. Try popping your own popcorn on the stove, using olive oil. Once popped, forgo the salt, but add flavor by sprinkling on cayenne pepper, lemon pepper, Parmesan cheese, herbs or nutritional yeast. 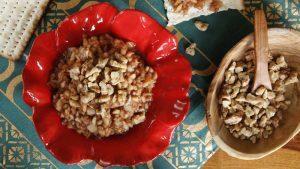 You can even sweeten up popcorn using cinnamon, nutmeg or apple pie spice. Three cups of oil-popped corn contains 165 calories and 19 grams of carb. For a long time, potatoes have gotten a bad rap. They’re blamed for packing on the pounds and raising blood sugar levels. However, potatoes contain nutrients that promote a healthy heart, including potassium, vitamin C, fiber and magnesium, plus antioxidants. For a change, look for purple potatoes. They contain four times the amount of antioxidants as Russet potatoes. One half-cup contains just 70 calories and 15 grams of carbohydrate. Plus, you won’t be able to resist their beautiful purple hue. Think of eggs and think of cholesterol, right? Well, not exactly. 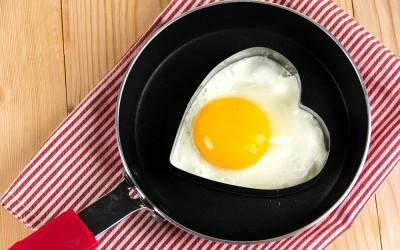 Yes, eggs contain cholesterol, but not as much as you might think (only 212 milligrams per large egg). More importantly, the 2015–2020 Dietary Guidelines state that dietary cholesterol is no longer a nutrient of concern for overconsumption. This means that you can enjoy eggs as part of a healthy eating plan without worrying that they’ll raise your cholesterol level. Eggs are delicious and easy to enjoy anytime. For a quick breakfast, try making scrambled eggs in the microwave — in a mug! Check out the recipe here. One large egg contains 78 calories, 6 grams of protein and less than 1 gram of carbohydrate. Want to learn more about protecting your heart? Read “FDA OKs Two Medicines for Cardiovascular Disease in Type 2 Diabetes” and “Living Well With Heart Failure,” then test your knowledge with our heart disease quiz.